Tis the season, for things. Our friends over at We Love Fine have sent word of several sales that will be taking place this coming holiday week. Start at Midnight (Pacific Time) on Wednesday, November 27th, many of our popular featured MLP products (including work shirts, polos, kids, leggings & more) will be available for up to 20% off. Plus we have a selection of clearance MLP products available for deep discounts and great deals. Beginning on 11/27, we will also have our My Little Pony scent GWP items created by Black Phoenix Alchemy Lab available in WeLoveFine’s Achievements; customers can add them to their cart as a free gift with orders of $100 or more. The Derpy figure on sale at SDCC is no longer alone. She’s now joined by a DJ Vinyl Scratch figure. Both were designed by Sajira, from the Mighty Fine artists program. 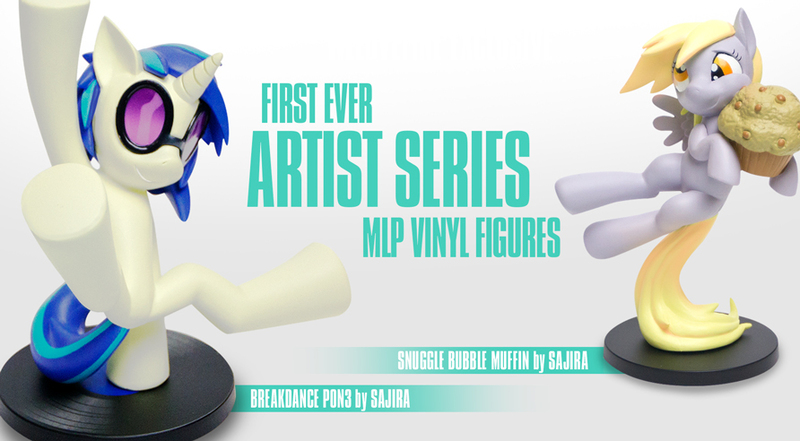 Vinyl’s figure is limited to 600 units and is available for purchase for $20 when customers buy two or more MLP products. Vinyl counts as one of the “achievements” freebies that you can “unlock” by placing certain items in your shopping cart. Any two MLP shirts, hoodies, bags or art prints allows her achievement to be unlocked, but unlike other achievements, you still need to pay for her. The Derpy figure will remain a con-exclusive, where she’s available for purchase when you buy other WLF items, just like at SDCC. You can check out the Vinyl product page here. Another update from WeLoveFine; this time it’s for a brand NEW product that we’re really excited about, and very much hope that the MLP fan community will enjoy what we’ve put together too! These are vinyl wallets featuring three of our very most popular designs including Rarity, Rainbow Dash and Princess Luna! Each one includes a separate ID card holder, space for 3 credit cards and a bill fold; they are $12 each. Here are the individual links! Wanted to let you know that as we did with Emerald City Comicon, based on overwhelming fan feedback, we’re making our exclusive MLP tee designs available at MegaCon in Orlando, FL this weekend available online. We have *limited quantities* of these so we’re asking folks to get them while they last; they should be up for a few days, please let all of your followers know and we’ll keep them up while supplies last! Welovefine has added a plush white unicorn horn as one of its gifts with purchase. It’s attached to an elastic band to fit around your head. It comes with certain Rarity shirts. If you spend over $50, you’ll get the horn instead of the big bag. For more information, link to the shirts, and other free gifts you can get, check out Welovefine’s gift page. They also added a DJ P0N-3/Vinyl Scratch backpack. The straps are reflective and can fit almost anyone, though the pocket is only 5″x5″, so don’t expect to hold much in it. There’s a hole so you can string your headphones through it. She also comes with an LED music note pin that you can remove. Full details and ordering can be found on her item page. This Saturday while everyone is piled in the New York Comic Con, the My Little Pony Project 2012 will be holding their New York event. WeLoveFine sent over an announcement for us that they will be streaming live from the opening party, which begins Saturday from 6pm to 11pm Eastern. So if you are unable to attend, you can check them out via the web. Some copy pasta from WLF’s site. Is the Apple of New York’s Eye This Fall! New York (September 28, 2012) — Following the sparkling success of its Los Angeles debut, MY LITTLE PONY Project 2012 promenades into New York City this fall bearing gifts of friendship and magic for the Big Apple. Beginning Saturday, October 13, the highly-anticipated charity art exhibition, pop-up shop and event series kicks off a fun-filled three-day weekend of iconic pony delights for fans of all ages. Presented by Hasbro’s MY LITTLE PONY brand, We Love Fine, and Sweet Streets, MY LITTLE PONY Project 2012 is steps away from the New York Comic-Con Convention at a special pop-up space hosted by The Hester at The Eventi Hotel and New York Art Department and will be the epicenter of enjoyment and happiness for all! 6%Dokidoki, 64Colors, Bei Badgirl, Beast Brothers, Camilla d’Errico, Chikuwaemil, Cope2, Dabs & Myla, eimi, Hanazuki, Hime+you, Indie184, Jeremiah Ketner, Malcolm Stuart for Joyrich, Junie Moon, Julie West, Lisa Alisa, Lamour Supreme, Luke Chueh, Madoka Kanoshita, Martin Hsu, Onch Movement, Perez Hilton, Rob Reger, Shojono Tomo, Sucklord, TOUMA, and more. The My Little Pony Project in Los Angeles this spring inspired many artists to excursions into the creepy or the Foalpaper(s)-esque. (Who still remembers their banner with Pinkie Pie and Rain-, no wait, Rarity in very particular poses?) This fall another installment of the project—organized by Sweet Streets, We Love Fine, Hasbro, and others—is going to go down, this time in New York City, starting on October 13–15, the weekend of the New York Comic-Con. Behind the page break is the event information from the We Love Fine Facebook page. License Magazine recently released an article outlining Hasbro’s new merchandising deals (Complete with G3 pony image) for 2013, with several new deals for pony merchandise. There’s a pretty big focus on the Asian market, with several new deals being made with companies to produce merchandise there. Weirdly enough, there seems to be nothing new in the way of continental Europe. You can catch the full list of deals after the page break, or you can click the article link above.